You can use a small piece of transparent plastic tubing from the pet store or hardware store for this project, but by all means recycle if you can – plastic tubes left over from setting up a fish tank looks great filled with seed beads too. 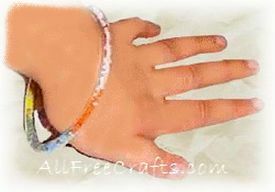 This project is easy to do, although an adult should help you to seal each bracelet with a small amount of hot glue. 1. If you are using tubing that has already been used for a fish tank, make sure you wash and dry the tube thoroughly before beginning this craft project. 2. Cut the tubing to fit your wrist or ankle, but do keep in mind that the finished bracelet must also fit over your hand or foot as well. 3. Tape over one end of the tube. 4. Start filling the tube with different colors of seed beads, so you make different colored sections. You can make a pattern by repeating the colors; for instance, you could make a patriotic bracelet in repeated sections of red, white and blue beads…(or red and white for Canada Day) Continue repeating the colored beads until you get to the end of the tube. 5. Carefully remove the tape, making sure that you hold both ends of the tube upwards so the beads don’t fall out. Ask an adult to put a little bit of hot glue on the ends and hold them closed until the glue dries. 6. Wrap clear tape around the join so that if the hot glue comes apart, the bracelet will still stay together. This project would be fun to do at a birthday party or pajama party – and all your guests can take home their own seed bead tube bracelet. Well, not always. But, for a different look, you might want to try making a bracelet with a wider tube that will fit larger beads. Make tube bracelets to celebrate special occasions. Red and green seed beads would make a nice Christmas bracelet, or use shades of green for St. Patrick’s Day, or red and white for Valentine’s Day. Do you belong to a sports team that uses particular colors? Wouldn’t it be neat for each member of the team to have a seed bead bracelet in your team colors? Or maybe you have a secret girl’s club – colored bracelets that you make together (only for club members, of course) could be a cool activity to share.